Source: Estonia's security police Kaitsepolitsei annual report 2009. The border guards waited at the Airport of Tallinn, when an airplane from Moscow landed and Galina Sapozhnikova crossed the border of Estonia. The 47-year-old woman with coal-dark hair and sparkling eyes is a contributor to the Russian newspaper Komsomolskaya Pravda. She lives in Tallinn and Moscow. In 2008, Sapozhnikova co-founded, together with the Estonian entrepreneur Igor Teterin, the media-club Impressum. The non-profit brings foreign public figures – writers, actors, and activists, including Efraim Zuroff from Israel, famous for his Nazi prosecutions – to Tallinn where they meet with invited journalists and other guests. Estonian security police Kaitsepolitsei keeps a close eye on Sapozhnikova. The agency believes Impressum promotes anti-Estonian propaganda. It reports that guests of her media club often glorify Russia, and promote nostalgic views of the former Soviet Union. The 2009 annual review by the secret police states that Impressum tells its members that Estonia was the most developed part of the former Soviet Union, and is now one of its poorest members with no economic future. In one recent meeting in December of 2011, the auditorium in the Meriton Grand Conference & Spa Hotel (Tallinn) was full of Russian-speaking people, who came to see the popular actress and TV-star Alla Dovlatova from Moscow. 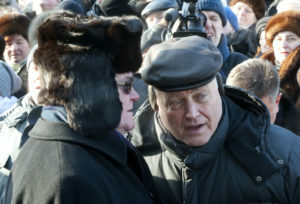 Teterin emphasized that the meeting was not political. Then he announced that every guest could sign a petition against the current Estonian education reform just outside of the meeting-room. The recent education reform policy mandated that all Russian-speaking high schools must teach at least 60 percent of material in Estonian. About 20,000 people, primarily Russian-speaking, have signed the petitions opposing such reforms. 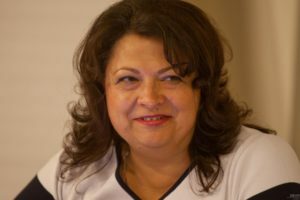 Sapozhnikova created similar media-clubs in Latvia, Moldova and Crimea under the name of Format A3. She told Re:Baltica that she started her actions from Estonia because it is much easier to open a non-governmental organization (NGO) here than in Russia. But who is financing the operations of this active NGO? Kaitsepolitsei believes that Impressum gets most of its money from Russia. Border guards searched Sapozhnikova when she arrived from Moscow, and she seemed prepared. Sapozhnikova had just a little bit less than 10,000 euros, which by law she doesn’t have to declare in Estonia. Sapozhnikova mentioned that the border guards have searched her very carefully seven times during the last three years, and that she never broke the law. When Re: Balitca asked her to comment for what purposes she carries large sums of cash on hand when she travels from Moscow, she declined to comment. According to the annual reports of media club Impressum, the non-profit received only 44,000 euros in donations between 2008-2010. Sapozhnikova refused to disclose the sponsors of her NGO, but she said that expenses are small: flight tickets, hotel rooms and auditoriums. None of the guests are paid. She said the sponsors are mostly businessmen. “Look, who can say no to me when I ask for money?” Sapozhnikova joked. She is a really charming lady. In its reports, Estonian security police describes Impressum as a leading example of how the Russian state methodically spreads its positions and values through propaganda in the Baltic States. On the first glance, the report states there is nothing harmful about Impressum. But in the long term, the consistent messaging that approves the behavior of Stalinist Soviet Union and denies the occupation of the Baltic States, calls Estonia’s territorial integrity and independence into question. The agency also argues that such consistent propaganda creates ethnic divisions and prevents peaceful integration of Estonian, society where every fourth person is an ethnic Russian. In June 2007, Russian Prime Minister Vladimir Putin signed a decree to create the Russkiy Mir (Russian World) foundation. The purpose of this foundation is to promote the Russian language and culture and create Russian Centers all over the world. In December 2008, the first of these centers, the Pushkin Institute, was opened in the Baltic States in Tallinn. The renovation of the rooms cost 40,000 euros. 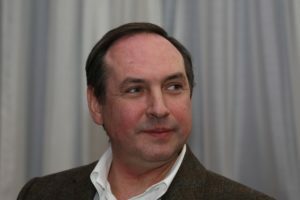 The director of Russkiy Mir, Vyacheslav Nikonov, from Moscow attended the opening ceremony. 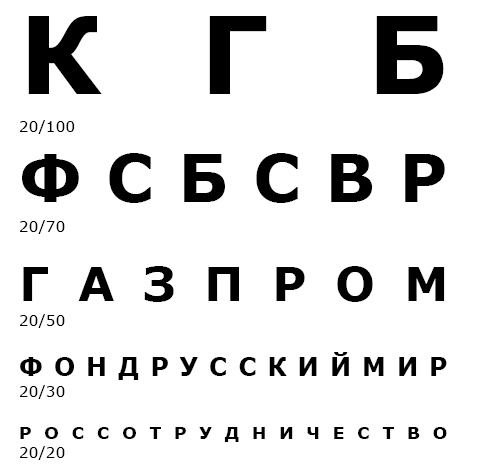 The main idea of these centers is to popularize Russian culture and teach the Russian language. The Russian government is ready to spend large sums to teach Russian: the 2011-2015 budget for the Russian Language Program is 2.5 billion rubles (over 61 million euros). But the Russian government doesn’t disclose how much of that money will come to Estonia. According to the last annual report from 2010, the Pushkin Institute got 122,500 euros. Inga Mangus, a member of the board of the Pushkin Institute, confirmed that most of this support came from Russkiy Mir. Another important NGO for Russia’s “soft power” (.pdf)– employment of culture and PR to spread its influence – is the Human Rights Information Center in Estonia (Inimõiguste Teabekeskus). The Center’s mission is to protect the rights of minorities, oversee the integration process and provide legal aid. This NGO got a little bit over 400,000 euros in donations between 2008-2010. Some of this money came from Russkiy Mir. The rest came from the Russian Embassy in Estonia, City of Tallinn and the European Union. In June 2009, the Center launched a fight against increased instruction in Estonian in Russian-speaking schools. The project of the Center, called “The creation of conditions for supporting continued education in the Russian language in Estonia through the implementation and use of European anti-discrimination principles” was supported by Russkiy Mir. Russkiy Mir’s website lists over 100 organizations in Estonia, but the fund doesn’t list the amount of funding it granted to each organization. Most of the NGO’s are very small and their annual reports don’t have sufficient information about their activities and donors. Many NGOs have not published any reports, and the state doesn’t seem to enforce it. Estonian NGOs are required by law to publish their annual reports, but they don’t have to list the names of their donors, unlike in Latvia. In Lithuania they have to give the names of donors if members of an NGO or media asks. In Latvia, NGOs have to submit the list of donors to the State Revenue Service. 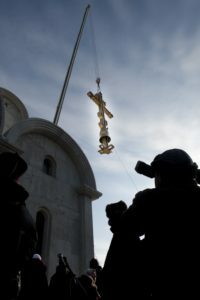 Most of the financial support from Russia in 2010 went to the Orthodox Church in Estonia, which is very popular among Russians.In 2010, the Estonian Orthodox Church of Moscow Patriarchate got 1.24 million euros for building a new church in Tallinn. 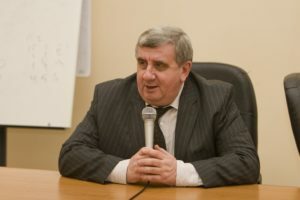 According to a report of Kaitsepolitsei, most of this funding (826,000 euros) came formally from companies connected with Sergei Petrov, who is active in the transit-business of Russian coal through Estonia. Kaitsepolitsei believes Petrov was only a ghost person and that the real decision to provide this support was made by Vladimir Yakunin. 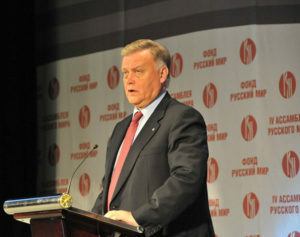 Yakunin is the president of Russian Railways, which is one of the most powerful companies in Russia. He is also a member of the board of trustees of Russkiy Mir, and chairman of the committee of trustees of the Center of the National Glory of Russia. Yakunin is a close ally of Vladimir Putin. In 1985 and 1991, Yakunin worked for the Soviet diplomatic mission in the UN. 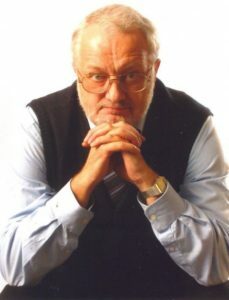 During his childhood, Yakunin lived in Pärnu, Estonia. He has visited Estonia many times, because the wellness of Estonian railways depends on the decisions made in Moscow – Estonian railways work mostly for the Russian transit-businesses. Edgar Savisaar, the mayor of Tallinn and leader of Keskerakond, the biggest political party in Estonia, asked for money to build a new church in February of 2010. A few months later, Savisaar secretly asked for money again. His party had large debts. According to Kaitsepolitsei, Yakunin promised Savisaar that his party would get 1.5 million euros (500,000 euros in cash). Keskerakond never got this money, though, because this secret deal was exposed. Of course, Russkiy Mir is not the only source of money for Russia’s “soft power.” In 2011, the Russian state spent 786 million roubles (19.3 million euros) for its so-called “compatriot policy,” or support of ethnic Russians living abroad. The cities of Moscow and St. Petersburg have their own programs for compatriots. In conditions, where there is not enough public data on the sources and the use of funding by the NGOs, sometimes even Russian officials are suspicious. Security police announced that in the winter of last year Russian diplomat Vjacsheslav Tutchnin started questioning how, exactly, millions of Russian rubles were spent for printing and circulating the magazine Baltiskii Mir and how the music festival Vivat Rossija was financed. Tutchnin suspected that some money was being laundered. Shortly after the online portal Regnum, which is led by conservative Russian activists, launched an attack against the embassy. Tutchnin left Estonia for health reasons. The message was clear: don’t ask too many questions.